I have a 1992 ford ranger 3.0l v6 5 speed. today i ran out of gas and when i got gas back in the truck it would not start, it would crank and try to start but still wouldn start, sounds like a fuel problem, i sprayed gas in my breather hose to try to get it to star and still nothing. so i checked my fuel pump relay,( in the fuse box under the hood, its just a big maxi fuse, super large but looks like a normal fuse) so i swapped my fuel relay fuse with another 30 amp fuse and it fired right up. it just dont make any sense because if the fuel relay fuse was bad i would figure my truck still wouldn start because i swapped the fuel relay fuse with the e.e.c fuse. the truck runs now but idles really high when you start it and ocassionally when you let off the gas it sticks and you continue tto move. and still occasionally will crank and try to start but just wont fire up it doesnt make sense any ideals would be greatly appreciated. Have you connected a fuel pressure gauge up to see what the fuel pressure is when the engine doesn't want to start? If so, what is the fuel pressure when the engine doesn't want to start? Ford did have issues with their EEC IV fuel pump and EEC relays back then. If you think you have a relay issue, they are not too expensive to replace. If you do confirm you have no or low fuel pressure during the no start, you need to confirm if the pump has good power and ground. You would have to test at the pump connector itself. Using a volt meter back probed into the electrical connector, you should see between 10-12 volts on the pink/black wire and less than 0.5 volts on the black wire while cranking the engine during the no start. Fuel pressure should be around 30-45 psi. Another thing to be careful of is that the EEC relays on some may have a diode built in to suppress voltage kick backs into the engine controller. The fuel pump relays had no suppression, so swapping them could cause problems. Fuses and relay are two different things. I don't know why swapping fuses made is start unless it was a coincidence. Both relays will work for either circuit if swapped, but like I mentioned the EEC relay may have a diode built in to protect the ECA from spikes. When you are testing circuits you really want to test them when they are active. 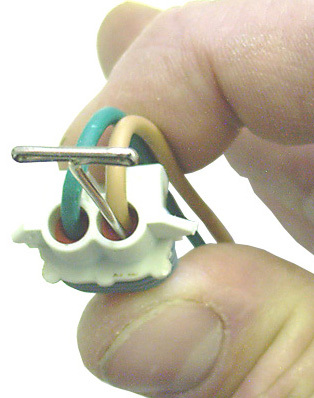 If you disconnect a circuit's connector, the circuit becomes open and testing open circuits can lead you down the yellow brick road if you have resistance problems in a circuit. Back probing allows you to make voltage measurements without disabling the circuit. Basically you are probing the rear of a connector using a pin or other method, so you have something to connect your volt meter lead to without poking a bunch of holes in wiring. You always want to have your meter connected to the battery negative if possible. If you can't, for some reason, reach the battery negative, you must find a good ground. It is imparitive the meter has a good ground reference or your measurement will be inaccurate. You really only would want to make voltage measurements when you find you have low or no fuel pressure, so take each thing one step at a time and we'll try to walk you through it. Ford fuse box confusion...LOL Don't worry. Your not the only one to be confused by Ford's fuse box fuse numbering system. Let us know what you find out about the fuel pressure when it doesn't want to start up for you. i will, thank you very much for your time! When i start my truck it revs up really high like it would after sprayin ether down the breather hose ,then it idles back down, it does this every time i start it now. and it even idles high when you coast down the road or push the cluthch in, not as bad as it does when you start it but still higher then it should, do you have any ideas? and it has not not wanted to start yet today but when it does i will test the fuel preassure. Is the check engine light on? A malfunctioning TPS or ECT sensor could cause a higher than normal idle. You can measure the voltages from these sensors to see what kind of input the ECA may be seeing. The TPS voltage at idle should be around .5-1.0 volt. The voltage on the ECT circuit varies depending on engine coolant temperature. If the PCM sees a higher than normal TPS voltage at idle, it will think you are pressing on the accelerator and will increase pulse width making the engine rev. If the ECT is telling the engine that the coolant temperature is really cold all the time, the computer is going to increase idle speed and add more fuel. One other thing that could cause high idle speeds is a power steering pressure switch that is stuck closed all the time. The ECA monitors the pressure switch to increase idle speed when the power steering system is under load. Vacuum leaks can cause a higher than normal idle. They also might cause surging at idle and the check engine light to come on for O2 sensor codes. Just comment to clarify: It hasn't started at all today? Does that mean NO reaction from ether? I'm not so sure using a breather is enough for that but rather right into throttle body. It wouldn't need a fuel system at all to react if it had spark. The fast idle for Fords (others too) when totally cold for a time exposed to about 40F do have high idle for a few seconds or more but not much more than 30 seconds until you get nasty cold would be normal mixed into diagnosing this. OK - Let me try to focus in some more. Re-read post #11 by DS = Discretesignals for some tests most people could do. Other is this seems to have bee fine till running OUT of fuel then this behavior. Just that comment means fuel pump was struggling for more fuel and they can be harmed by that so knowing it has proper fuel pressure WHEN you experience this counts in the diagnosis. It's plenty old enough for surprises too so rule out as much common stuff as you can like vacuum leaks ever common and mess things up. Lazy right now but you can get code readings without tools off of this but I have the stupid thing which really just counts CEL blinks and gives some direction especially if CEL stay lit. No so sure they will remember long if a fault was detected and light is not on now. It also must work on many (not sure on this vehicle) which will light if you just turn key to "run" and not start it as a bulb check. Know that any codes are a direction to a circuit not telling you to replace any certain item, even this old. Sorry if a repeat but you should be concentrating on fuel pressure and vacuum leaks anywhere vacuum would be. Base of throttle body, intakes to head(s) all rubber hoses and the items they run to. If rubber elbows anywhere are in trouble they might fully break in you hands and so on. Some of this stuff lasts much longer than this is some doesn't and some get swollen with oil and don't work properly and even fall off? Thought on this: How are you so sure of no vacuum leak? You aren't - trust me. It's plenty old enough unless you assertively went thru about all possible areas or was done along the way. Unmetered air will cause idle to rise or the info vacuum send along to assorted things are telling it wrong info and it adjusts to that. Load on engine is lower vacuum and items adjust as if you are driving uphill or just accelerating harder when you aren't doing anything which confuses it. Vacuum isn't just hoses it's all gaskets to where intake seals as well. Fuel filter? I can't think of how a plugged one could raise idle but rather loss of power or not run if that bad. Fuel pressure: Plain call for free rentals in your area. Autozone varies and like places as to what they will rent free for 100% deposits. Sorry if a repeat but have you cleaned up throttle body and IAC yet? Can't remember (sorry) on a 3.0 of the vintage if that bolts on to clean or built in another way. They used to fail more to stalling than high idle when an issue though. Idle may also go up with high pressure on power steering or air conditioning and either could be not sending correct signals. Unplug A/C or should be a square relay and rule that out and see if high pressure PS line has a wired thing in line to it at all as that's what that would be for. Back to checking vacuum leaks: Carb cleaner on a leak while running should raise or lower RPM if one is found. There are a few ways to test for leaks that's just one. Water sprayed. Wiggle lines. Brake booster of all things may even work fine but leak a little. Always be careful with checking spraying around a warmed up engine and ready for adverse reactions including a fire which should go right out unless you go nuts with a flammable. Back: It's because it ran OUT of fuel that it's on a suspect list for something erratic IMO. If I find it I post how to get codes without the silly plug in tool which was dirt cheap and just counted blinks then look up the corresponding #. Not so sure it will be a ton of help unless your CEL is always on or on intermittently and vague info for 92 also IMO. Out of the blue does cable to throttle body fully pull back to base idle? Could be something that silly and missed? Did somebody hide their stash in the gas tank? Correct, you can check the ECT sensor signal using a volt meter. You really need to read up on ford thermistors, so you understand the function. You also need to know at which temperature the voltage should be. Have you asked your local parts store if they have a tool loaner program. Autozone loans out tools such as fuel pressure gauges I believe. That would save you some money. Your volt meter black lead has to be connect to battery negative and the red lead back probed into the ECT's connector on the light green/red wire. Also inspect the ECT connector terminals and pins. I've seen them corrode (turn green) and cause issues. There's a lot easier way to check it if you have a scan tool that reads data. Simply look at the data before the engine is run and the IAT and ECT should read the same temp. I suspect you are having a tough time having tools or equipment but the battle isn't lost. ECT, engine coolant temp sensors are rare to fail for me. If you have a plain volt/ohm meter and not much more from cold to warm it should read differently and IMO that's enough that it alone works not "partially" working. In short, it's correct or totally wrong all the time. Someone correct me if wrong ---- won't this default to thinking it's totally warmed up if you just unplugged it? Tools and such: There's no great time to need crap you don't have and the costs never mind the rat race at any store about now. Analog volt/ohm meter. $10ish just seen at Walmart or any similar type chain stores with an auto dept or even trailer and battery crap. Lower at a Harbor Frieght as in FRIEGHT! Smile. Again - rentals from parts outlets. Plain phone calls and check place by place. Web suks and won't know if one does or doesn't or it's already out that fast or at all. No, it will default to -40 degrees in most cars. my fuel pump continues to run even when key is turned off and then other times it wont turn off at all , i cant seem to find an actuall relay for the fuel pump, only thing i can find is in the fuse box under the hood it says fuel relay but its just a big maxi fuse not an actuall relay ? It's on the fender probably under a plastic cover under the hood. If OE probably has the green skirt still aftermarkets won't and OE ones do not fit each other on this type. Aftermarket ones do. Not sure if it has power all the time with key off but might or crossed up somewhere but shouldn't stay putting power to fuel pump at all when enough pressure is built up or never mind when key is off! I could actually go check on this type to plain see if they have power when key off but don't feel like it right now. Note - if this type and that's what shows you push the bail to remove it not lift up. Most break anyway and still work just fine. Also most that fail plain don't work and no fuel pump empowered at all. Those on the cars anyway are all the same for at least A/C and others in and or under where they are. If stuck for parts take the A/C one, if OE you need to cut the bottom plastic off which makes it only fit the socket for that and not fuel pump relay and then you'll need both if that worked as it would wreck the A/C relay for water proofing. Pricey suckers still for what they are. Aftermarket ones fit assorted items in same area with a skirt without being dedicated to one item only as OE did. Better than all that is to test it. If mounted like the cars just bend it up to gain access a bit, whack the correct one and it might quit. Toss those if that changes it and test for power present all the time which would surprise me but can't verify. Oh - The A/C relay if OE was black with gray skirt (I think) and should have one of the wires to it is black with yellow stripe same as you'll find at the aluminum accumulator's pressure switch.